This is an unusual love affair between a Portuguese woman and a Indian Mughal prince which describes the intensity of her love that the Portuguese woman by the name Dona Juliana Dias Da Costa had over Shah Alam, the son of Aurangzeb. It is said that she not only assisted in safeguarding the Christian in then Mughal-ruled India but was also responsible in spreading the faith in Portuguese India. 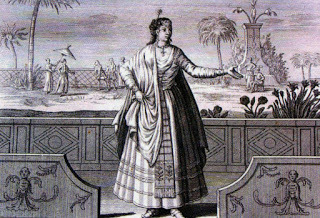 Dona Juliana Dias da Costa was considered to be a woman of Portuguese origin from Kochi in the court of Aurangzeb the Mughal Empire in Hindustan. She became Harem-Queen to the Mughal Emperor of India Bahadur Shah I the son of Aurangzeb who became the monarch in 1707. Her family had fled the Dutch conquest of Portuguese Kochi while she herself ended in the court of the Mughal at Delhi serving the family of the prince Shah Alam. She continued to be there till the prince did not find favour with his father and escorted him into exile. She was then rewarded when Shah became the Emperor – Bahadur I after the death of his father and her influence became boundless in the court in spite of being a Catholic in a Muslim state. It is said that she had galloped on a war elephant with Bahadur Shah during his fights in order to defend his authority and after his death she continued to be greatly considered but with less influence. While Bahadur Shah I had been alive, she was frequently sought out by European powers such as the Dutch, Portuguese, the British and the representatives of the Pope during her period of strongest power. She was of great help to the Society of Jesus inclusive of assisting the Italian Jesuit missionary Ippolito Desideri in his mission in evangelising Tibet. In appreciation of her various contributions together with services to the Jesuits, she had been recognized as a Patroness of the Society. Tiwari and Chauhan had come across the diplomatic role of this Portuguese Catholic woman in the 80s, who had spent four years to write disputably the most inclusive documentation of Mughal, Portuguese, British, Dutch and French interaction in India. They have related the Portuguese method for survival with the Mughals with the help of the love affair story between Juliana and Shah. From the moment they had a well-known settlement in Hugli through the favour of the Mughal Emperor Akbar, the Portuguese were comfortable being there till they annoyed his son with their misbehaviours which resulted in sacking the settlement in 1632. As a consequence, 4,000 Christians had been taken captives in dreadful conditions to Agra. As per the book, the parents of Juliana were among the prisoners and Juliana was born in Agra around 1645 wherein her mother by that time had been attached to one of the ladies in the harem of Shah Jahan. After the death of her parents Juliana had been brought up in Delhi by Father Antonio de Magalhanes. According to the authors, Tiwari and Chauhan due to the upbringing under the Jesuit Fathers, together with the years she had spent in Goa, provided her with the proficiency of skills which made her a diplomat par excellence. Though Juliana was married, she became a widow at a young age and in 1681-82 paved her way for access to the Mughal court with the help of Father Magalhanes. Tiwari had mentioned that the Aurangzeb had entrusted the education of Prince Muazzam – later Shah Alam, which was his second son, to Juliana. She had been 17 and his youngest tutor. Muazzam was 18 and was filled with sorrow for the merciless imprisonment of his grandfather Shah Jahan and with this began their lifelong love affair. The book had also provided the Portuguese letters which had been written by the viceroy in Goa to the Portuguese King expressing him of the favour Juliana tends to hold in the Mughal courts. Juliana stated that the book moved wherever Shah Alam had been posted by Aurangzeb inclusive to Goa in order to end the threat posed by Sambhaji the Maratha leader. Later on when Shah Alam had been suspected of treason by Aurangzeb and imprisoned, it is said that Juliana had risked her life in making his seven years of imprisonment, comfortable by sneaking in items of luxury to him. Her faithfulness rewarded her when Shah Alam eventually ascended to the throne after the death of his father Aurangzeb. The book also explains the role of Juliana in assisting Shah Alam in winning the battle to the throne against his own brother. It is said that Juliana got Shah Alam to organize the Portuguese gunners in his artillery and that proved to be a fruitful move. The book also mentions of her correspondence with the viceroy of Portuguese in Goa as her power rose in the Mughal court under Emperor Shah Alam - `What becomes more than clear from the exchange of these letters to and from Juliana is not only the higher position attained by her at the Mughal court after the release of prince Shah Alam but her continued devotion in making favours to the cause of Christianity from the Mughal territories also’. In addition to her diplomatic services the book has also recorded the financial help provided by Juliana to the Portuguese. It states that it was around 1707 that she had said to have given the province of Goa a great fortune valued to 40 to 150 contos. When she died in 1734, the Goa Personnel report of 1735 addressed her as the `Worthy Benefactress of the College and Mission of Agra’ in a most strange statement.